This collection of thirteen short stories by Margery Allingham was originally published in 1989 and has been reissued by Agora Books this month. The title is maybe slightly misleading as Allingham’s famous detective Albert Campion only appears in half of the stories, but I actually found that some of the non-Campion stories were amongst my favourites from the collection. Of the stories featuring Campion, I thought the best were The Black Tent, in which Albert catches a girl stealing a package from a desk during a party and The Case is Altered, where he stumbles upon a case of espionage while spending Christmas with friends. I was less impressed with the other Campion stories in the book, but I thought these two were just the right length, were well plotted and had satisfying conclusions. There’s also an essay, My Friend Mr Campion, where Allingham describes how she created the character of Albert Campion (or rather, how he created himself) and later in the book, in What to Do with an Ageing Detective, she imagines herself coming face to face with an elderly Campion and his servant Magersfontein Lugg. 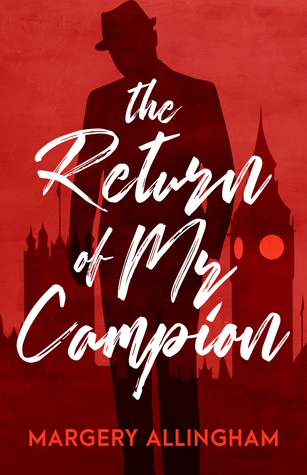 I found the first of these pieces interesting, but I think the second is really just for true Campion fans – which I can’t say that I am yet, having so far only read one full-length novel (Mystery Mile) and a few short stories. The rest of the stories – the ones which don’t involve Campion and are not necessarily mysteries either – cover a mixture of subjects and genres. I loved Sweet and Low, in which two women who have nothing in common apart from a love of horse riding compete for the attentions of the same man. The horse called ‘Sweet and Low’ has a personality of his own and is the real star of the show in this one! The Wind Glass, about a young girl who rejects a marriage proposal from a Japanese man and receives a rather sinister gift in return, is another one that stood out due to the genuinely eerie atmosphere Allingham creates, although it was difficult to ignore the overt racism which did unfortunately spoil that particular story for me. On a more light-hearted note, I think The Kernel of Truth also deserves a mention. A man prepares a recipe for punch and adds one very special ingredient – but his wife won’t be very pleased if she finds out what it is. This is an entertaining little story that you won’t fully appreciate until you read the final paragraph! Considering that I’m not usually a lover of the short story format, I enjoyed almost all of the tales in this collection, with only one or two exceptions. I’ll have to try more of the full-length Albert Campion mysteries soon! Thanks to Agora Books for providing a copy of this book for review via NetGalley. I think I’ve read most of the Campion books now, but I think the later ones are better, he definitely improved with age – and marriage. The short stories sound interesting so I’ll look out for this one. I’ve only read one of the very early Campion novels and didn’t really care for him as a character, so I’m pleased to hear he gets better with age! I have a problem with short story mysteries, usually, because I don’t think the form is long enough to do more than pose a puzzle. I might like the other stories better. Yes, I agree that mysteries usually work better as novels than they do in the short story form. I’ve read some of Allingham’s short stories in the British Library crime classic collections, at least one of which was a non-Campion story. I’m interested in this one, but I’ll take a look at the list of stories. I’m guessing I’ve read a few of them already. I know I’ve read that Christmas story at least twice, in two different books. Yes, that can be a problem when you read a lot of short story collections – the same stories tend to be repeated. There was one in this book that I’d read before too. You remind me that some time ago I set out to read all the Campion books in order. I should get back to that. That sounds like an interesting project, especially as I’ve heard that the character develops and changes over the course of the series. I used to love short stories; that’s after all the genre that got me hooked on reading as a hobby, but I moved on in favor of novels, and never looked back. Last year I read one short story collection and one of essays; both were outstanding, so I’m not ruling out including more of those in my reading. This collection sounds interesting, even if you are not yet a fan of this detective. The tales included give a tease to sample other works featuring detective Campion. I’ve never really been a fan of short stories, even when I was younger, but I’ve read a few collections recently that I’ve enjoyed (mainly Daphne du Maurier’s). As for Albert Campion, I don’t like him much as a character, but maybe I just don’t know him well enough yet!